We are a diverse club ~ ages 18 to 100+. We run Opti-Park in Broad Ripple by donations and volunteers only. Our mission is to provide hope & positive vision. We meet on the second and fourth Tuesday of the month at Noon. Grab lunch at the counter or salad bar and join us in the Community Room. We discuss current and past club activities and invite a speaker for each meeting. Join us! The Optimist Club of North Side Indianapolis has been running Opti-Park since 1957. We create events and activities for the youth in our community. We are completely a volunteer and donation driven organization. Our park is a private park is run by volunteers only. Optimist Clubs are dedicated to "Bringing Out the Best in Kids" and do their part through community service programs. Since each Club is autonomous and run by members of their community, Optimists have the unique flexibility to serve the youth of their area in any way they see fit. Optimist Clubs see a need in their community and react to it. (Near the Indianapolis Art Center). 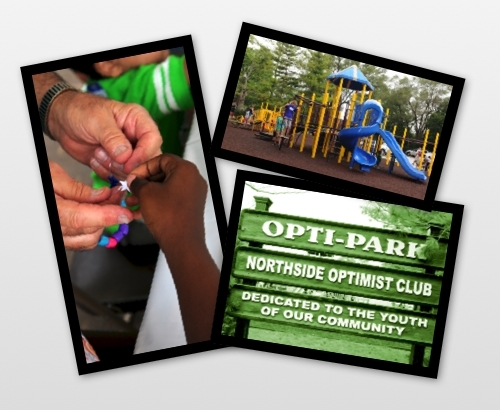 The 10-acre park includes a baseball diamond, playground, and picnic shelter and is owned/maintained by the Optimist Club of North Side Indianapolis, Inc.